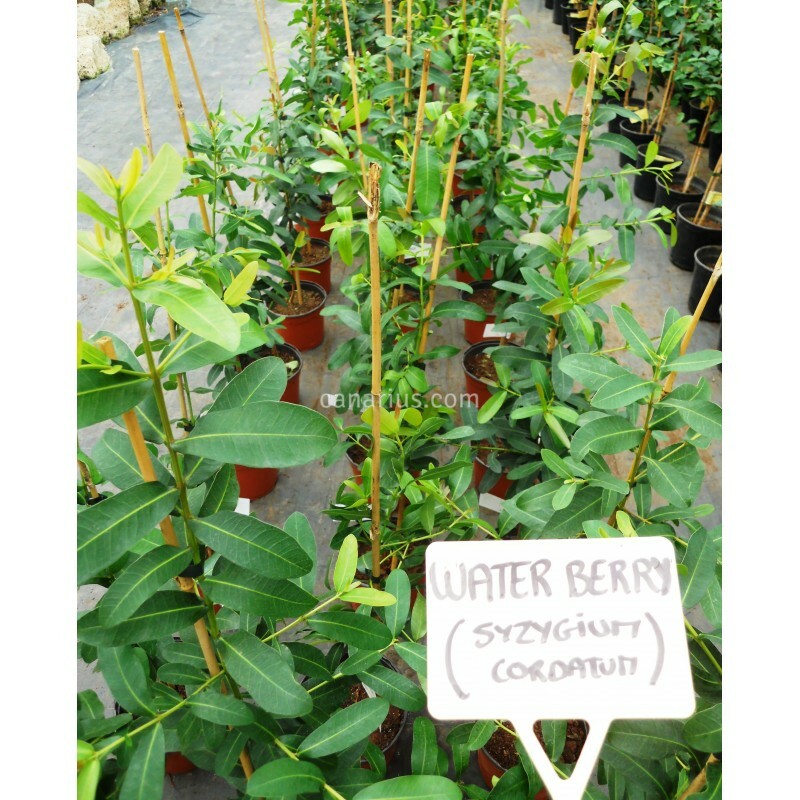 Shrub to medium size tree from South Africa to Mozambique. It has a very dense foliage and edible purple-black sweet fruits, very rich in anti-oxidants. 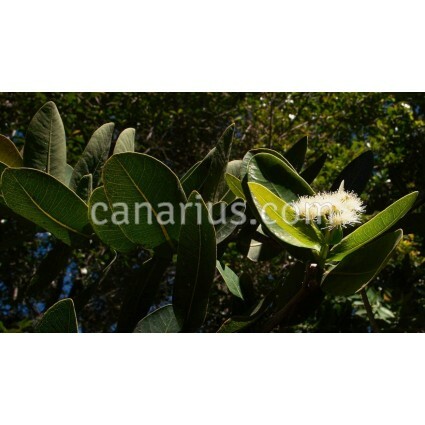 It stands harsh conditions and grows in Mediterranean to Tropical conditions. Occurs along streambanks from Kwazulu-Natal northwards to Zimbabwe and Mozambique. It grows in forest margins, in bush or open grassy and sometimes high country. This tree is known for its many uses. The fleshy fruit is slightly acid in flavour and is eaten by children, monkeys, bush-babies and birds. The berries are also used to sometimes make an alcoholic drink. The powdered bark is used as a fish poison. In central Africa the tree is known as a remedy for stomach ache and diarrhoea. It is also used to treat respiratory ailments and tuberculosis. Syzygium cordatum is a medium-sized tree, 6-15 (max. 20) m in height; dwarf forms 30-45 cm high have been reported; young trunks banded and blotched in grey and white and are fairly smooth; in old trees the bark is dark brown, light grey or reddish, thick, rough, fissured and can be pulled off in thick, corklike, square pieces; young stems squarish with winged edges. Leaves very many, near the ends of branches, thick, leathery, smooth, opposite, elliptic, oval or almost circular, up to 2.5-13 x 1.9-8 (17) cm, bluish-green on top, paler green under, gland dots inconspicuous; apex bluntly pointed to rounded; base round and notched; margin entire and often wavy; petiole absent or extremely short; midrib lateral with conspicuous net veins; usually stalkless but may occasionally have short stalks, in which case they may be confused with those of S. guineense; new foliage is bright red. Buds sturdy, in dense, branched terminal sprays, their round shiny pink tops appearing just above the smooth, green calyx. Open into creamy white to pinkish, sweetly scented flowers that yield excellent, abundant nectar; petals fall early, leaving the stamens forming an airy puff; stamens the most conspicuous feature, in dense heads, about 2-2.5 (max. 10) cm in diameter at the ends of branches; filaments 10-15 mm long. Fruit an ovoid, fleshy berry, about 1.3-1.5 cm, slightly oblong, deep pink, purple or purple-black when mature, ellipsoid with a permanent calyx on top, 10-18 mm long; inside the fruit is a single, whitish seed.